The World Health Organisation now says over half the population of many industrialised nations is overweight. A genetic gadget may help in the battle against the bulge by detecting high levels of dangerous fats and sending a message to the brain to turn off the appetite. High-calorie and fatty foods have a clear effect on our swelling outer appearance, but they also leave traces in the blood, where various fats circulate. Increased blood-fat values are regarded as a risk factor for heart attacks and strokes, but the new device could help warn a person before it is too late. A German research group has developed an implantable genetic circuit mainly composed of human gene components, which can constantly monitor the circulating fat levels in the blood. At the same time, a feed-back function forms a messenger substance in response to excessively high blood-fat levels, which conveys a sense of satiety (a full stomach) to the body. Biotechnologists created the incredibly complex regulatory circuit by combining different genes to produce particular proteins and reaction steps. They implanted the device in human cells, which they then inserted into tiny capsules. The researchers studied obese mice that had been fed fatty food. 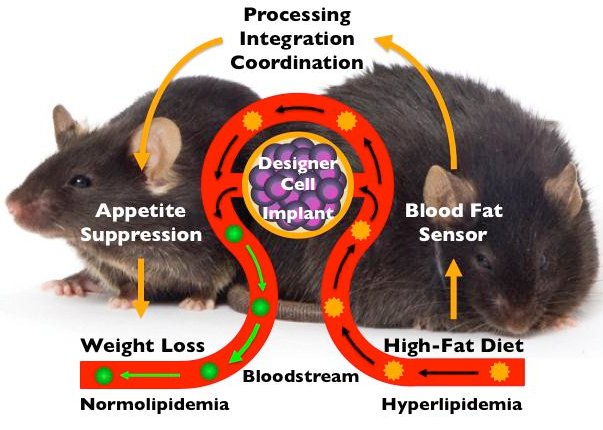 When the capsules with the gene regulatory circuit were implanted in the animals and intervened due to the excessive levels, the obese mice stopped eating and their bodyweight dropped noticeably as a result. “The mice lost weight although we kept giving them as much high-calorie food as they could eat,” Biosystems Science and Engineering Professor Martin Fussenegger said. The astounding synthetic/genetic regulatory circuit has a number of advantages, including the ability to measure more than one sort of fat – it can monitor several saturated and un-saturated animal and vegetable fats, which can all be ingested at once. Other advantages include that fact that it is almost completely non-invasive, far less so than surgical interventions such as liposuction or gastric bands. By relying on the in-built satiety mechanism and preventative measures, the implant could be used to stop someone spiralling into life-threatening obesity. Unfortunately it will be several years before the development can be transferred to humans. Nonetheless, Fussenegger says one day people with a high body mass index could have such a gene network implanted to allow them to lose weight. More information is available in the complete study, published here.